It’s a confusing story, which is just how groups like Every Child By Two prefer things to be. Like many organizations that abuse the 501(c)(3) rules of the Internal Revenue Service, Every Child By Two (“ECBT”) puts on a front to the world that they are an independent, compassionate organization of parents — originally founded by Rosalynn Carter no less — dedicated to the important work of getting every child vaccinated. 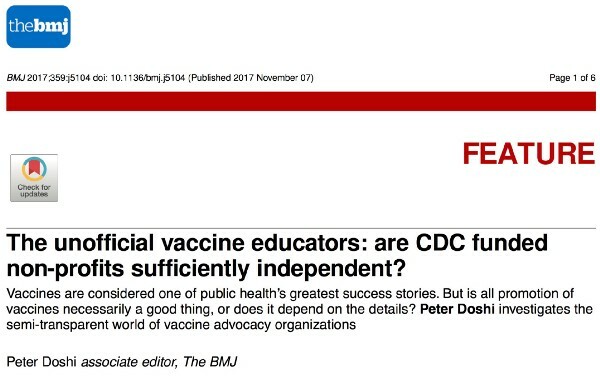 In fact, the organization is really a sock-puppet mouthpiece for two masters: 1) the Centers for Disease Control and, 2) vaccine makers, their two primary sources of funding. Recently, ECBT took a public stand against a new rule being proposed by the parent of the CDC, the Department of Health and Human Services (“HHS”). On January 26, 2018, the Office of Civil Rights within HHS issued a proposed change of rules, titled “Protecting Statutory Conscience Rights in Health Care; Delegations of Authority.” The new rule makes clear that HHS will enforce any violation of civil rights within the healthcare field, specifically as it relates to the either religious beliefs or conscience of a healthcare worker or a patient. For a group like ECBT, who lobbied heavily in support of SB277 — a California law passed in 2015 that REMOVED religious and philosophical exemptions from vaccines for children — this new rule, and the specific mention of vaccination, represents an enormous threat.